Our smallest Drone is optimised for television. This can shoot 4K and fly fpv, even at night! Flight times are up to ten minutes to get the shot you require, battery changes take about two minutes. This is a single pilot drone. 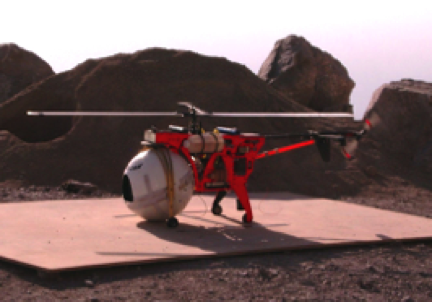 HOVERCAM has operated Helicopters and Drones for more than 25 years! 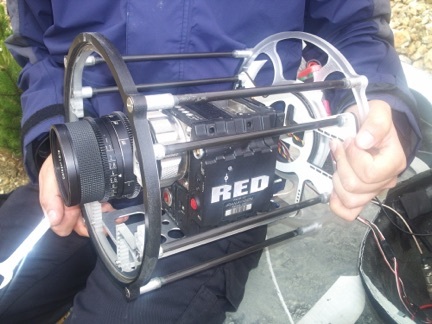 Longer higher range, higher speed, bigger better gimballed cameras with zoom lenses, longer flight times (up to 3 hrs), handles higher wind conditions, perfect for offshore filming and over hostile terrain. You can expect to aquire a lot of footage over a wide area in a short time. 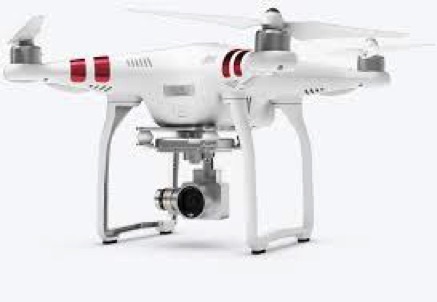 High operating costs, expensive to position on location, en route weather limited, fuel supply requirements, lots of noise and downdraft for close range filming, finding suitable landing permission /areas. Low operating cost, able to shoot at very close range and in built up areas, transported by road vehicle in all weather conditions day or night, low operating noise, very flexible to work with, perfect for slow, low level tracking shots near to the subject. Max height limited to 400ft above surface, slower speed (up to about 40mph), range from operator limited to 500m, operator needs to always see the drone, susceptible to windy conditions, low flight times (typically up to 10 mins), limited to wide angle lenses and constantly having to replace batteries, problematic for offshore or long range filming. You can expect to take all day to aquire a similar amount of footage you would achieve from just an hour with a helicopter. To Philip George and Gifford Hooper of Hovercam for the continuing development of the Hovercam miniature helicopter camera system. Our medium sized 4K DSLR Drone pretty much flies itself. If you want good, rock solid, smooth moves and stable filming with a Panasonic Lumix GH4 (With upgraded Vlog L giving 12 stops dynamic range) supplied, this is the bird for you. 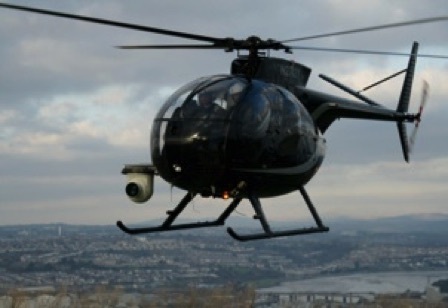 This is a two crew operated drone. 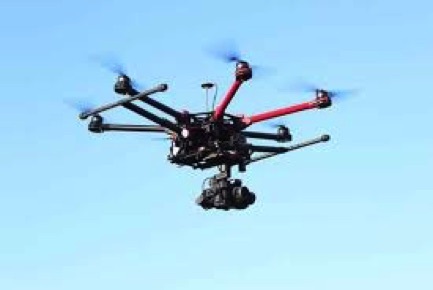 Our HOVERCAM is an Academy Award winning larger size drone and has a very smooth running and powerful turbine engine. 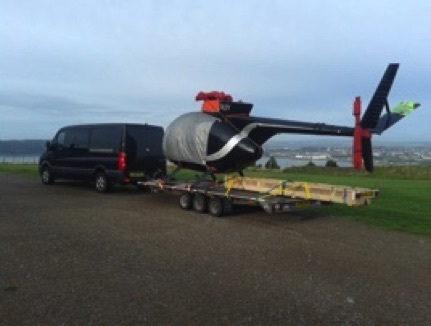 This five foot long Helicopter is capable of flying in more hostile / windier conditions than the smaller drone. The camera (typically a RED EPIC or a 35mm ARRI) is mounted in a gyro stabilised gimbal and may be panned and tilted independantly. Our pilot is CAA approved with over 30 years flying experience! HOVERCAM is operated by two crew. 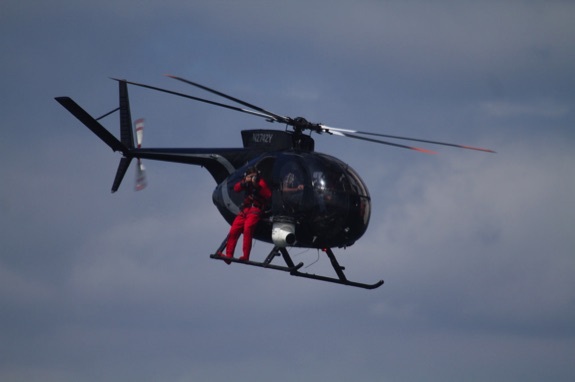 Our conventional, single engine turbine helicopter (Hughes 500) comes complete with our own specialist filming pilot, aerial cameraman and optional 4K/HD cinema camera gimbal with 15 stops DR.
Our filming helicopter (Hughes 500) can be transported long distances by road on a trailer. If you have a shoot anywhere in Europe, let us quote you a good rate to position there. (Cost usually based on 150p / mile and £500 / day travel time + expenses / ferry etc). All we need is a hotel near the location with a suitable area to take off from. We have vast experience shooting to a shot list and can send you the footage on a hard drive.